Up to 30 people braved the freezing temperatures by taking part in a sleepout event at Liverpool Lime Street Station. Four stations across the UK were home for the night for supporters of The Railway Children charity, who provide safety for street children across the world and closer to home here in the UK. They aim to make the public aware of their existence and persuade the UK Government to create better protection and care for them in the long-term. 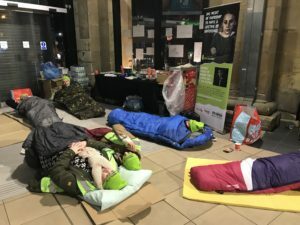 The Big Station Sleepout event aimed to give a valuable insight into the issue of not just homelessness, but also how children are sometimes groomed or trafficked through the railway networks. Each participant on Thursday night, including members of rail industries, paid £15 to take part, and pledged a minimum of £100 to the charity, hoping to raise more from sponsorship and donations. Gaynor Little, Head of Programmes for The Railway Children UK, said: “Young and vulnerable people are often drawn to railway stations as a place of safety. It’s a good place to blend in no one’s going to spot you. “We’re trying to overcome that, so that’s why we’ve picked stations to host this event. We’re really dealing with a lot of sad issues such as runaways, young people in care and young people that are groomed for criminal activity and sexual exploitation. 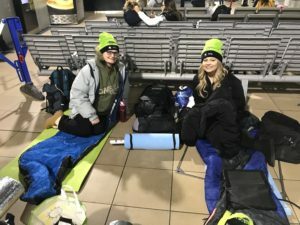 Apart from a sleeping bag, a few refreshments, and a roof over their heads, there was little protection from the below-freezing temperatures on what was the coldest night in the past six years. Also braving conditions was Steve Rotheram, Metro Mayor of the Liverpool City Region, who told JMU Journalism: “I’m here at the sleepout to try and raise money and awareness of what happens when children run away and unfortunately end up rough sleeping. “We want to ensure that people have the support and the systems they need when unfortunately they find themselves homeless. The Liverpool team raised £9,000 for the charity and collectively across all four stations the grand total reached £60,000. The other stations involved in the Big Station Sleepout were Birmingham New Street, Manchester Piccadilly and London Bridge.